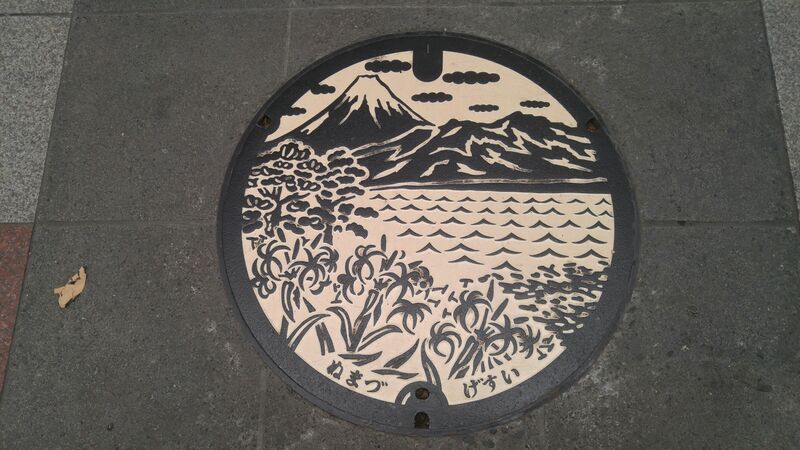 The large and medium-sized Numazu Mount Fuji Covers together! 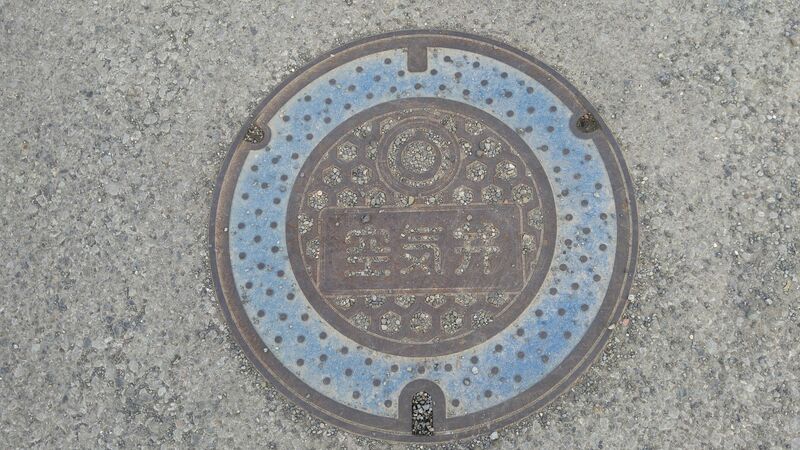 This is a roundup of manhole covers in Numazu City although it does not include the Love Lin! Sunshine!! 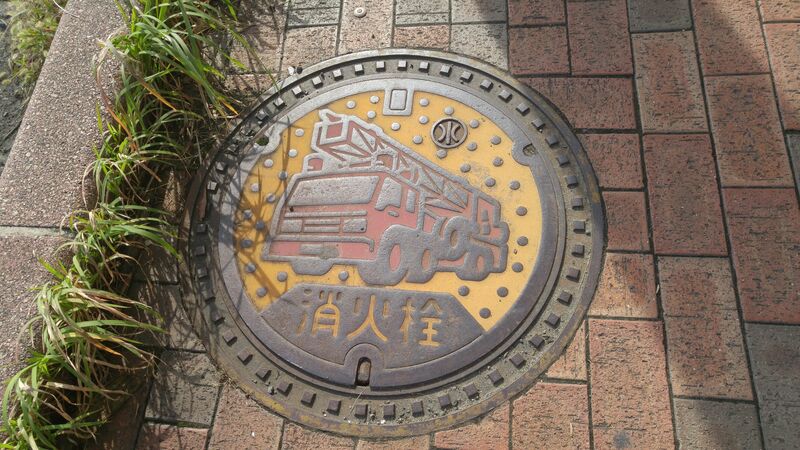 Manga Covers and places like Heda which were merged into the City. They will appear in future articles! 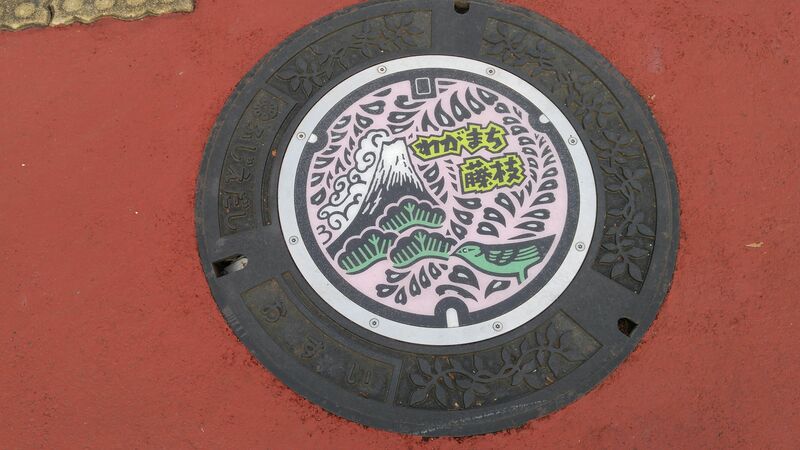 This is the beautiful color manhole covers they call “Mount Fuji” Cover in Numazu City! hard to find as there is only one to be discovered in the harbor vicinity! 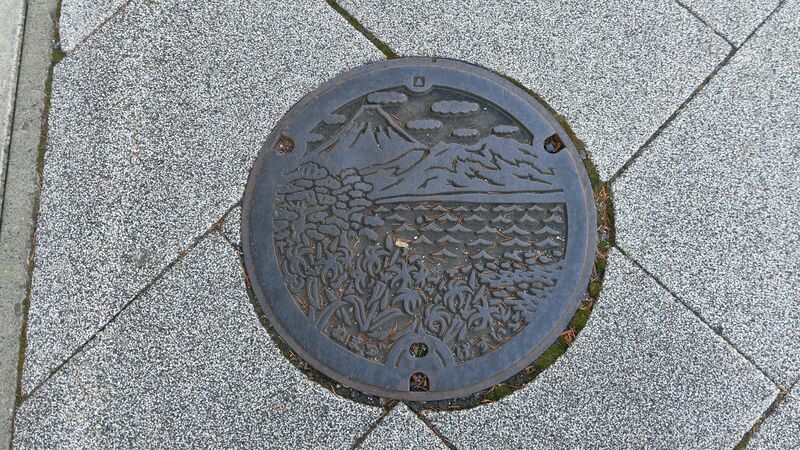 The large sized Mount Fuji cover to be found everywhere in town! The brand new one, in balack and white! 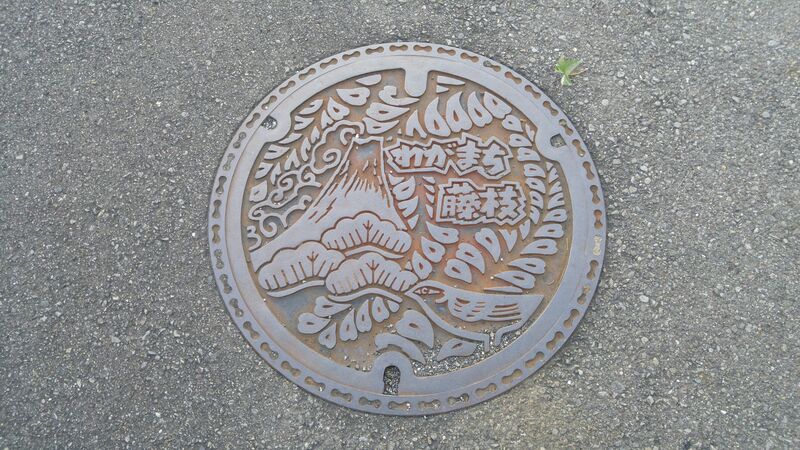 An older one with the Numazu City sigil in the middle! An even older one with the same sigil in the middle! 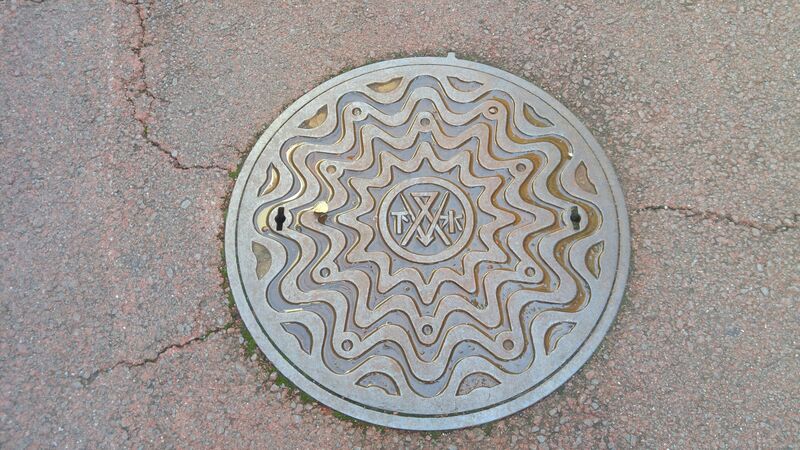 This type with the same sigil in the middle can be seen in various colors to follow the patterns on the pavement! 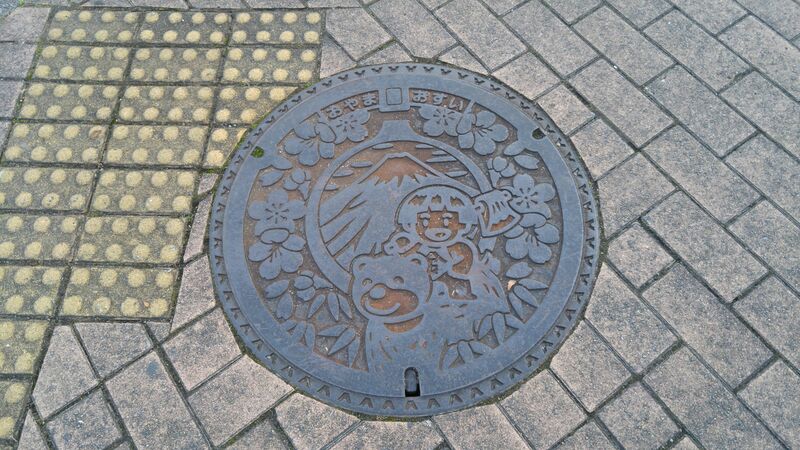 Manhole Covers in Shizuoka Prefecture 51: Oyama Ashigara! 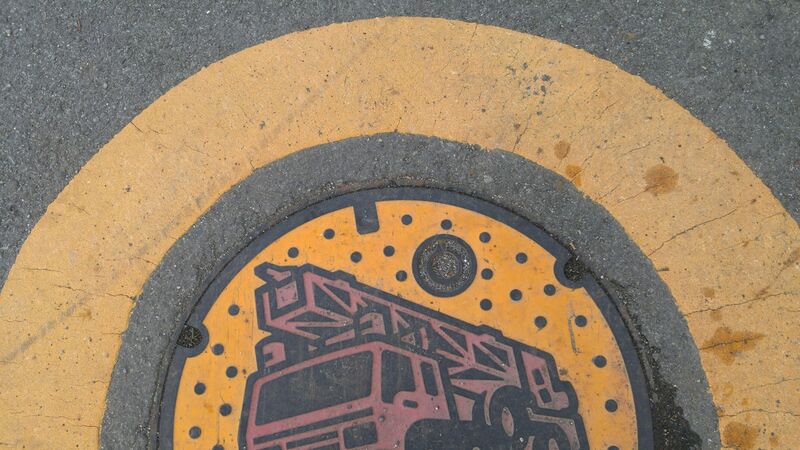 Fire Hydrant cover common to many places. You have to check the “logo/sigil”! This particular search turned into a real adventure! 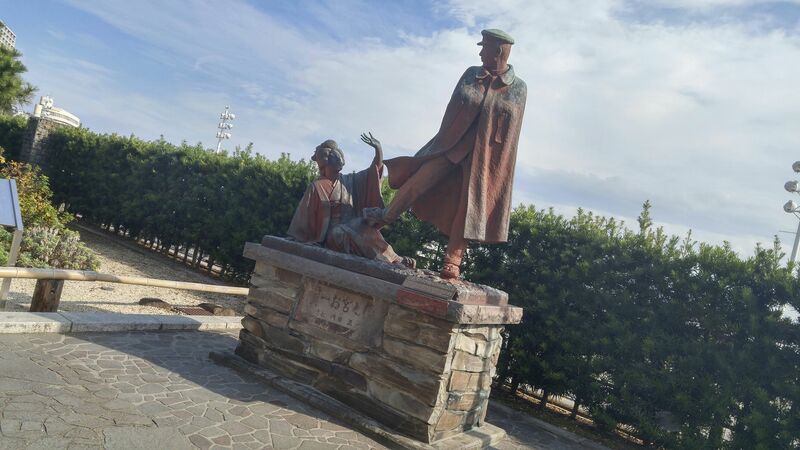 I started with a mistake getting off at Suruga-Oyama Station where I found out that the local Tourism Information had been closed for good for more than a year! 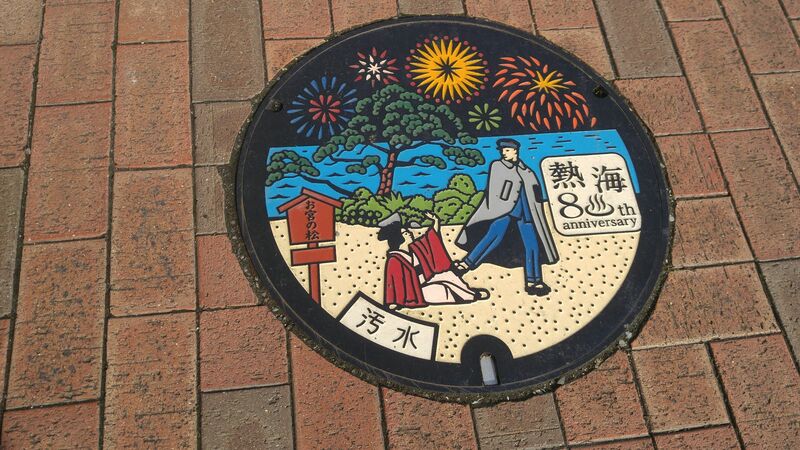 I had to take a bus and walk for quite a while to find my target at the Fujinomiya Rest Area! 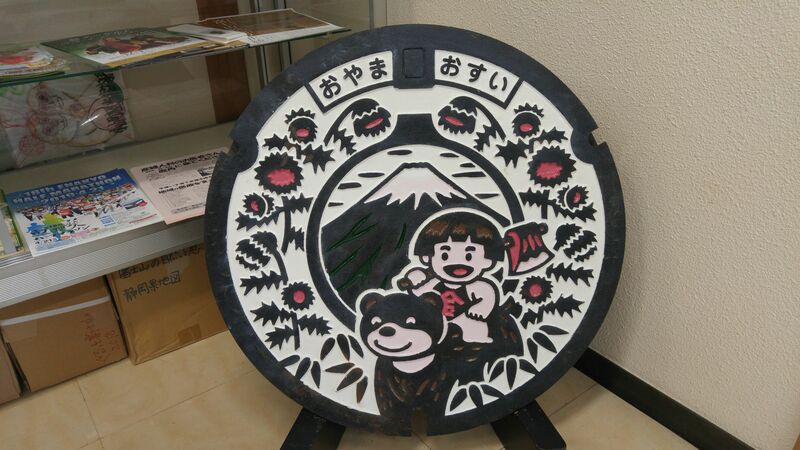 The circle logo/sigil means it belongs to Oyama Ashigara area! My target! 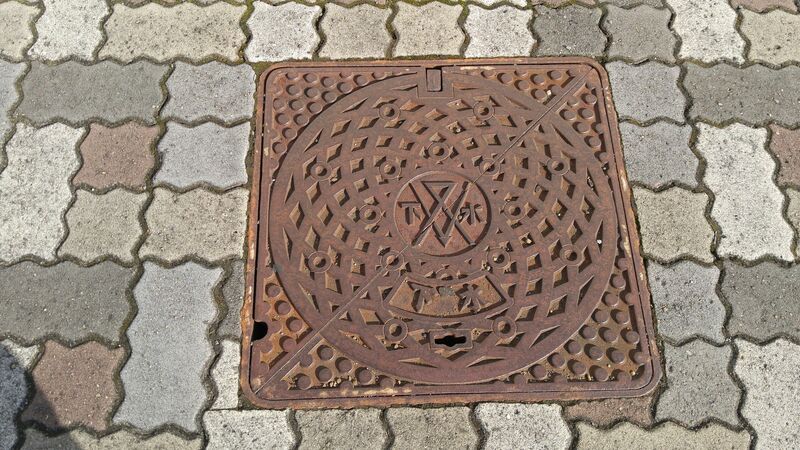 The only color Oyama manhole cover exhibited inside the information office at the Fujinomiya Rest Area! Great staff there incidentally! 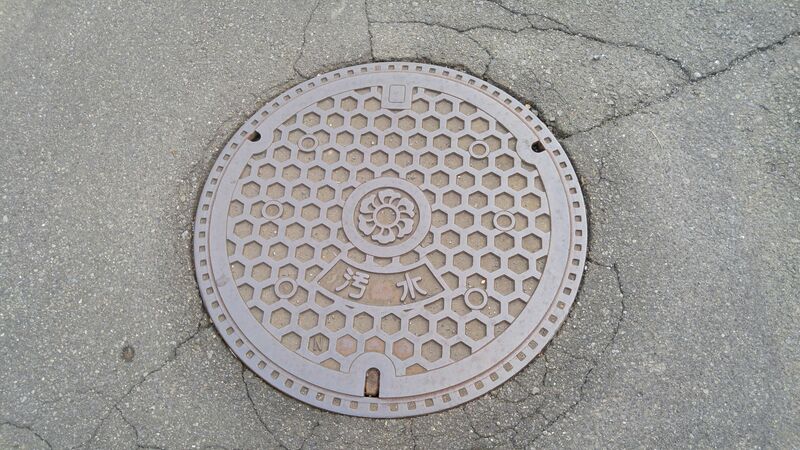 Pressurized air valve cover with Oyama Ashigara sigil! 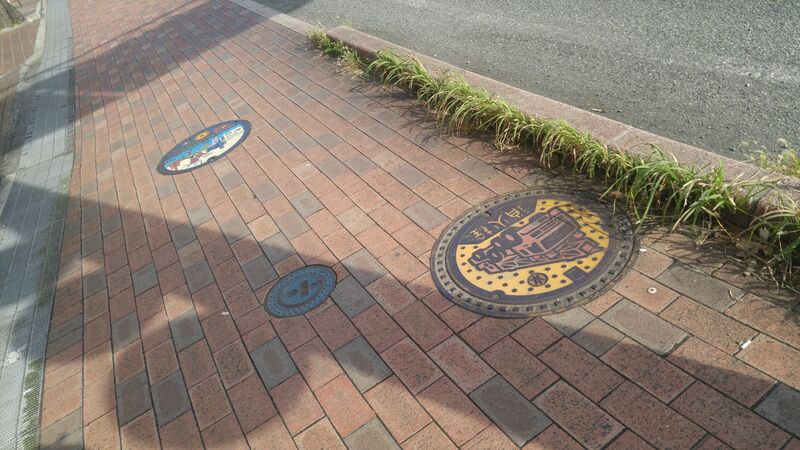 I had found out previously that none of Oyama Ashigara covers could be found around Suruga Oyama Station so I asked the staff where I could find them. They replied theris was the only one to be seen. 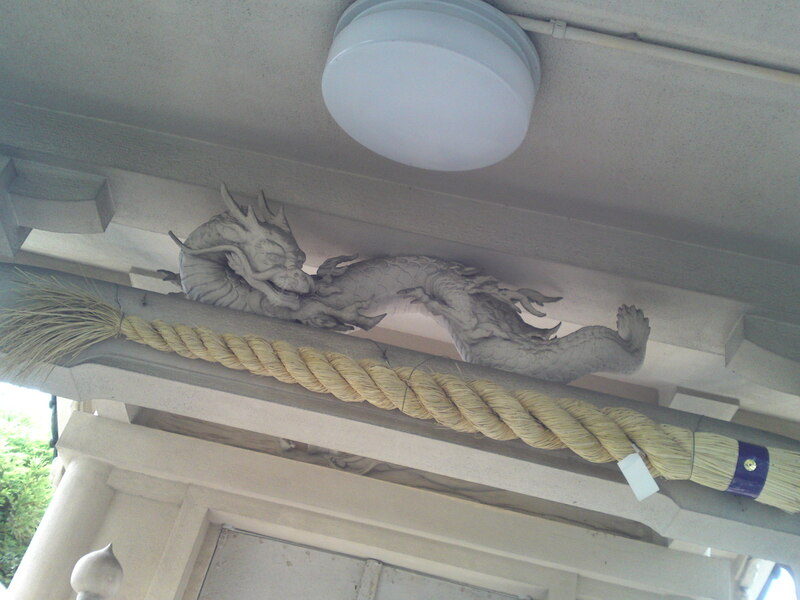 But I had seen photographs of uncolored ones near a station. 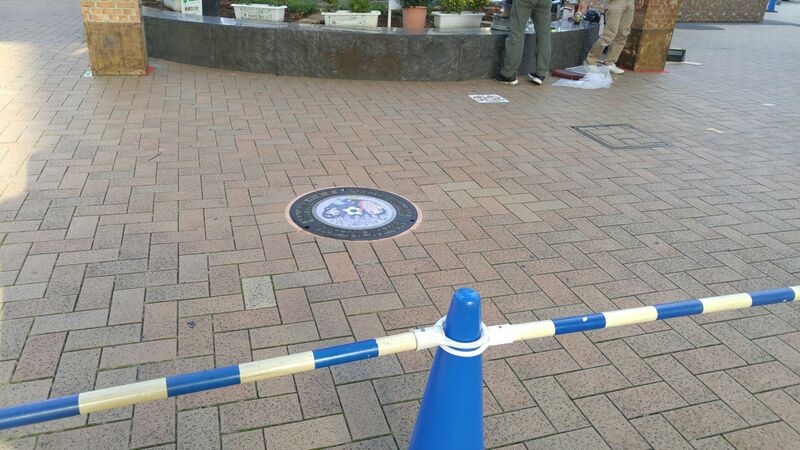 So It could be only Ashigara Statio, the one station before! 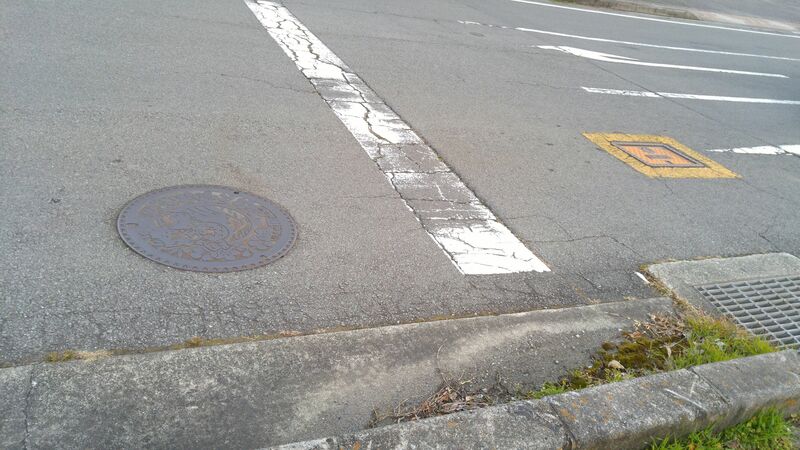 I ignored the advice and decided to walk all the way to Ahigara Station! 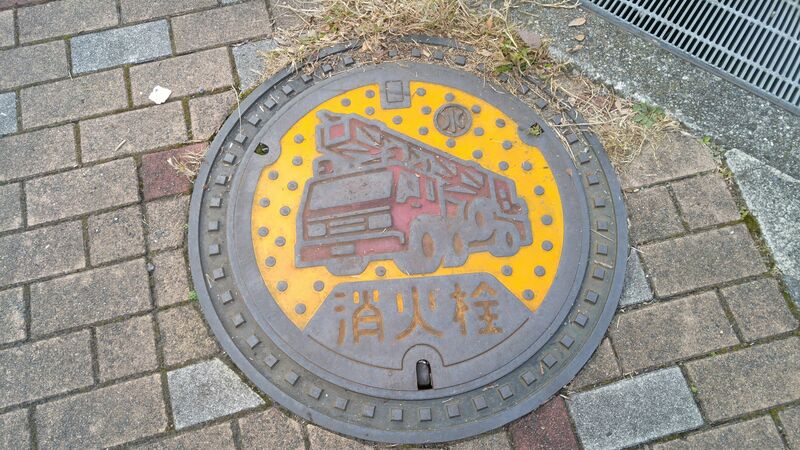 On the way I found this different typeof fire hydrant cover! 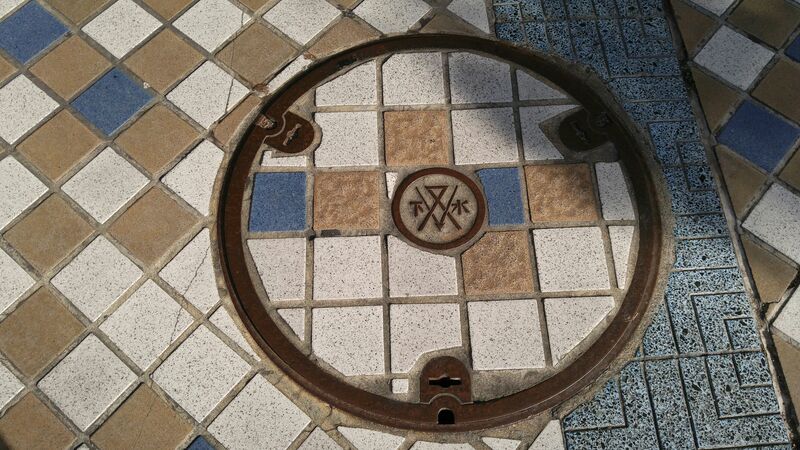 The kanji for “water” inside the sigil meant it was a common cver used in many parts of Japan! After a full hour walk my stubborness was rewrded! 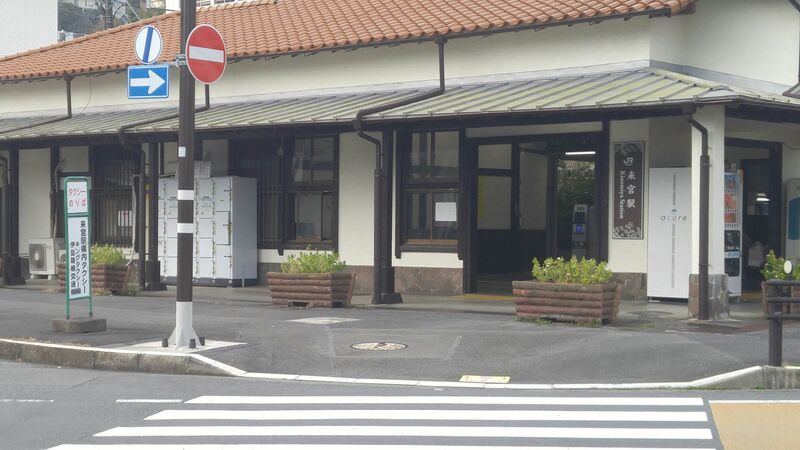 Ashigara (unmanned) Station along the Gootemba Railway Line! There were not one but half a dozen of them! 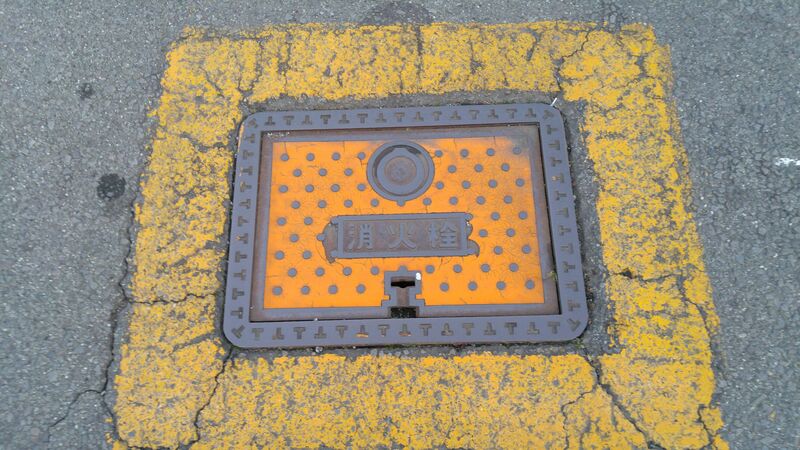 I also discovered this old fashioned rectangular fire hydrant cover with the Oyama Ashigara sigil! 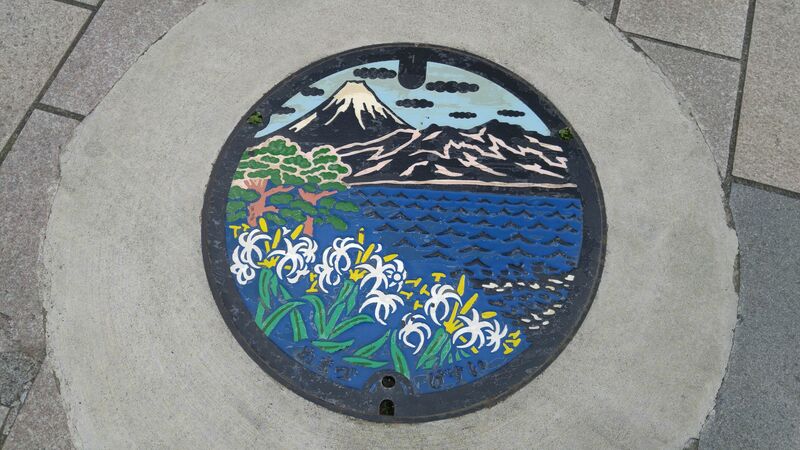 Manhole Covers in Shizuoka Prefecture 8 bis: New Covers in Atami City! Atami City at the entrance of the Izu Peninsula has always been borring of the the fame of the Peninsula, especially stories from the Nbel Prize writer Yoshinori Kawabata, famous for the Izu Odoriko as featured in Atami Yacht harbor by a statue of the famous scene representing a man kicking his lover with his geta/Japanese clog! 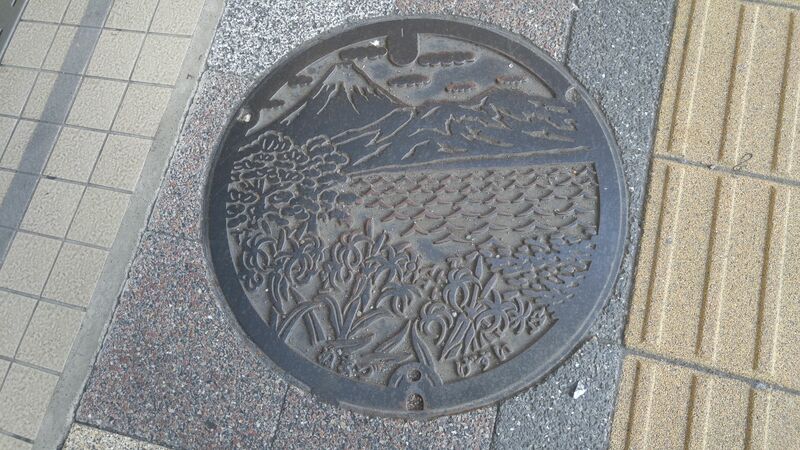 Along the pavement opposite on the far side of the street opposite of the city you will find interesting covers! Now, this the is the one you will be looking for! 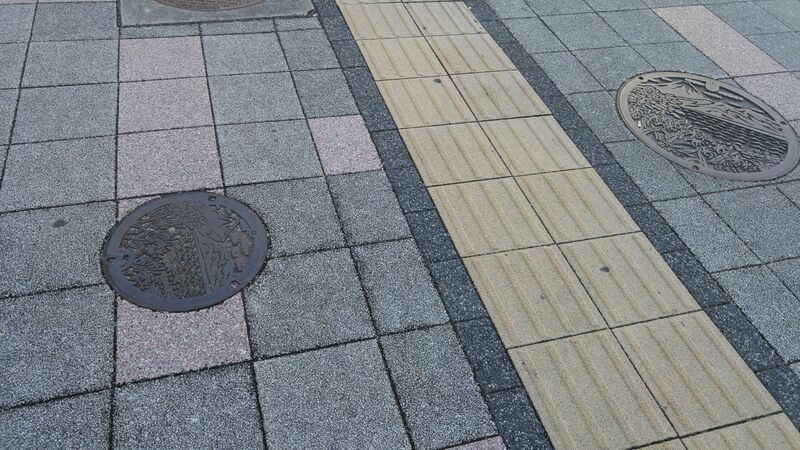 You will have to walk a bit, though, befor you will find it in front (there is only one of its kind!) 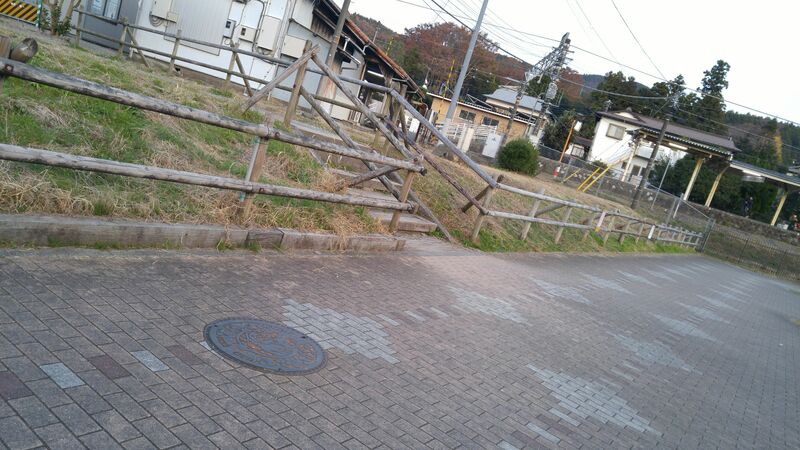 of the first station of the railway line leading to Ito City! 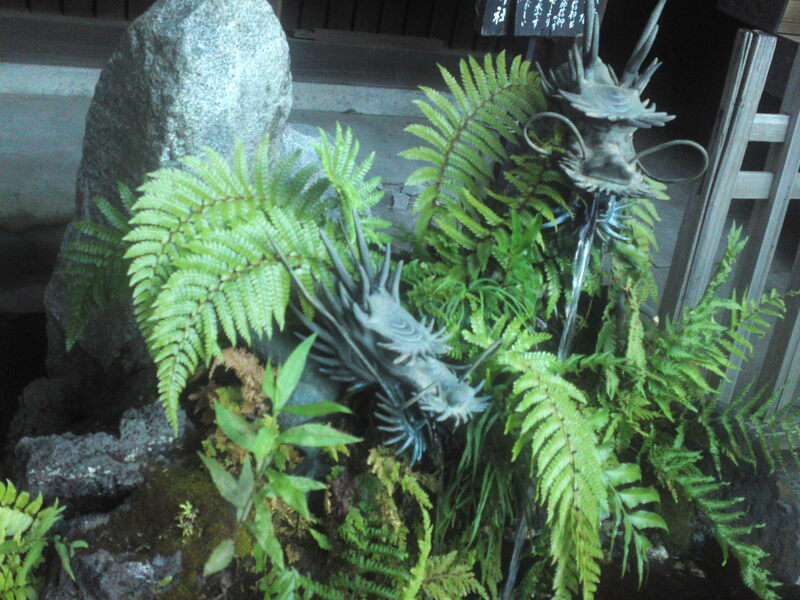 You will find them in their mint forms at the Atami Waterwoks Office! 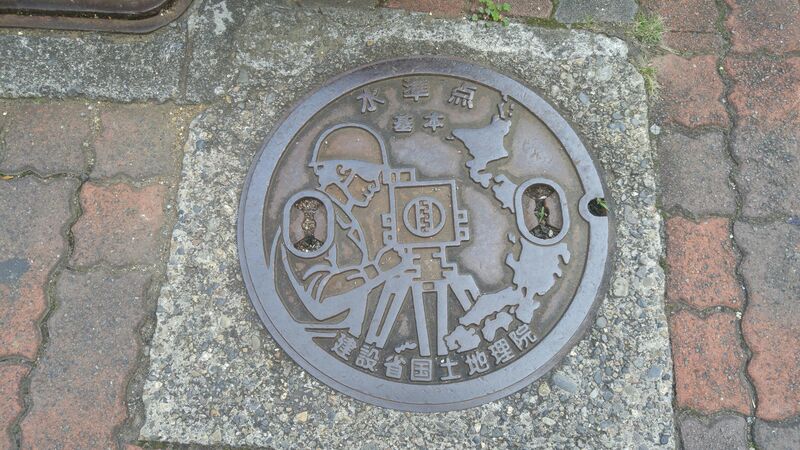 Walking down from the station you will discover this sall sized one found only in a few cities in Japan commerating Natiojnal Land Survey! 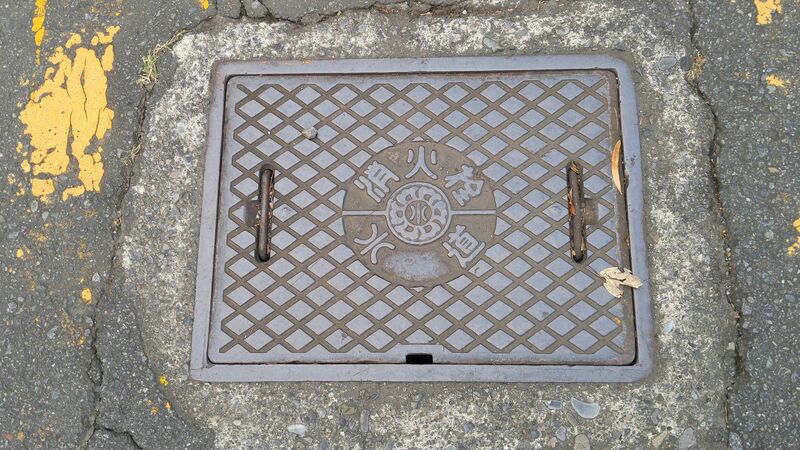 Manhole Covers in Shizuoka Prefecture 23 bis: Old and New Manhole Covers Roundup in Fujieda City! 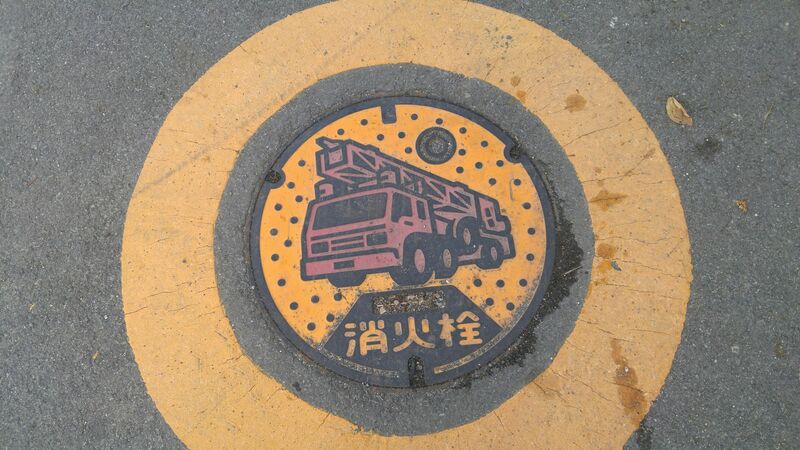 I heard tehre have been some additions to manhole covers in Fujieda City and I decided to investigate! 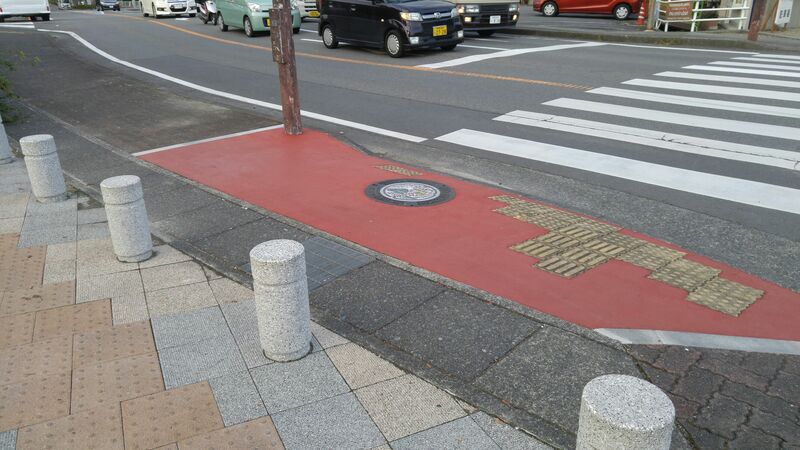 If you get down the south exit of Fujieda JR Station you will notice a new one on your right abot 50 meters away on the pavement! 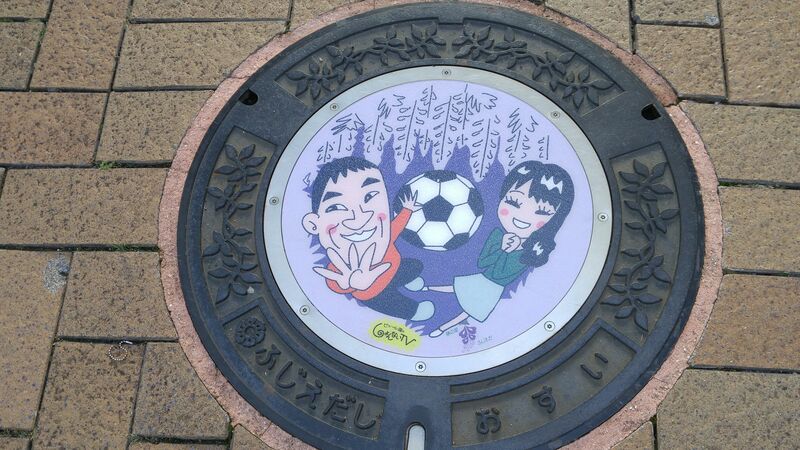 Fujieda City is arguably the City where the first game of football/soccer was played in Japan, hence the soccer ball! The gentleman is a famous TV talent and the lady a local TV announcer! 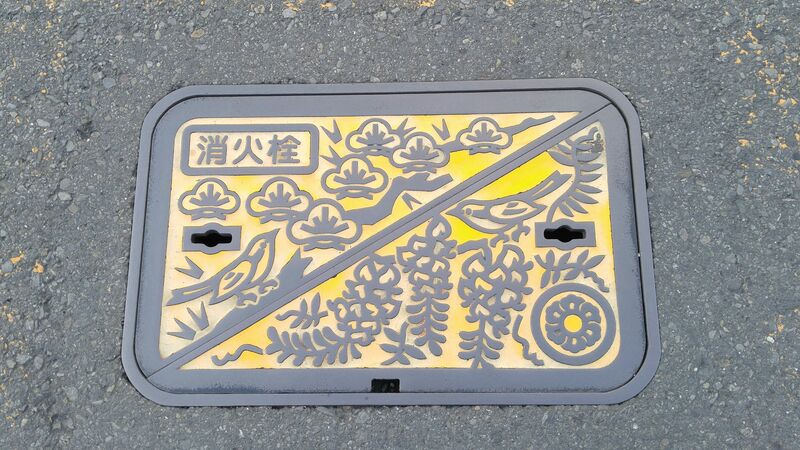 The wisteria (fuji/藤　in Japanese) is the emblem flower of Fujieda City which incidentally means “wisteria branch”! 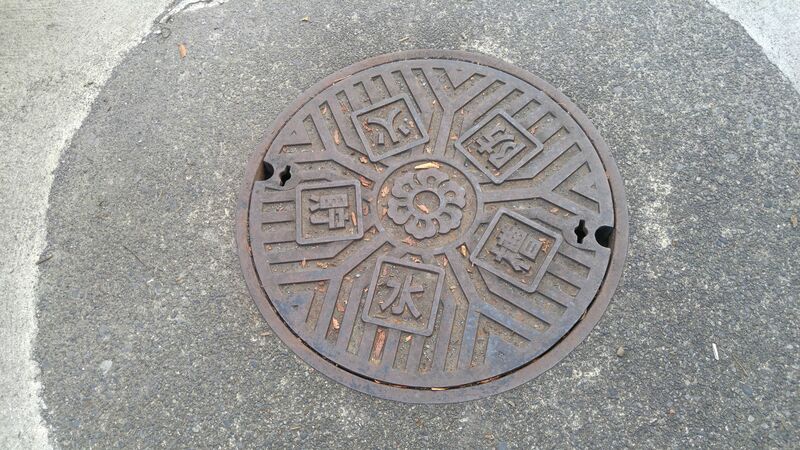 This manhole cover was obviously sponsored by a TV Company! 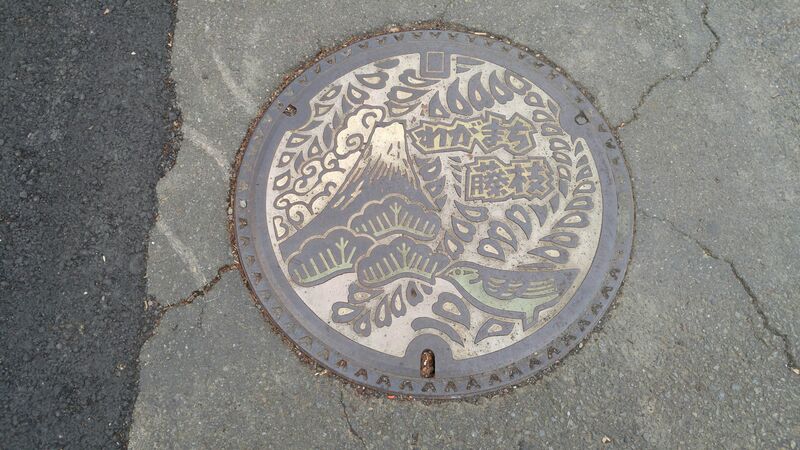 Here and there you will find this cover representing both Mount Fuji (“Fuji” is being used as pictorial pun as it both means Mount Fuji and wisteria). This kind i getting a bit old and it has become difficult to distinguish the slight differences in color of the two original ones. 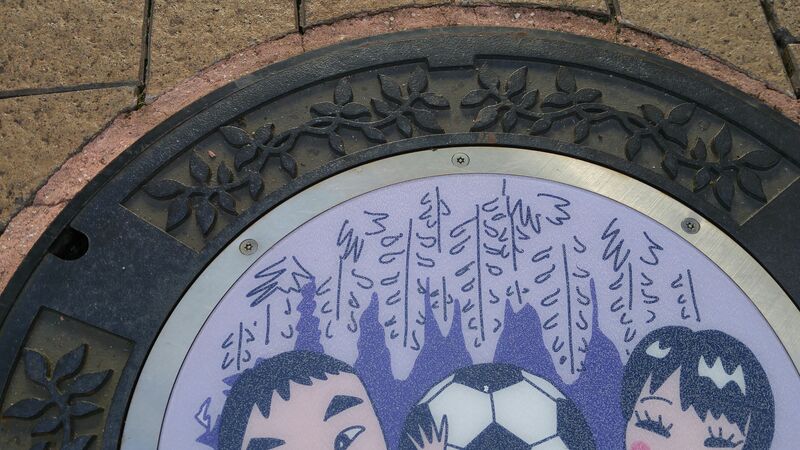 the bird featured there is the city emblem bird, the “mejiro/Japanese White-eye! 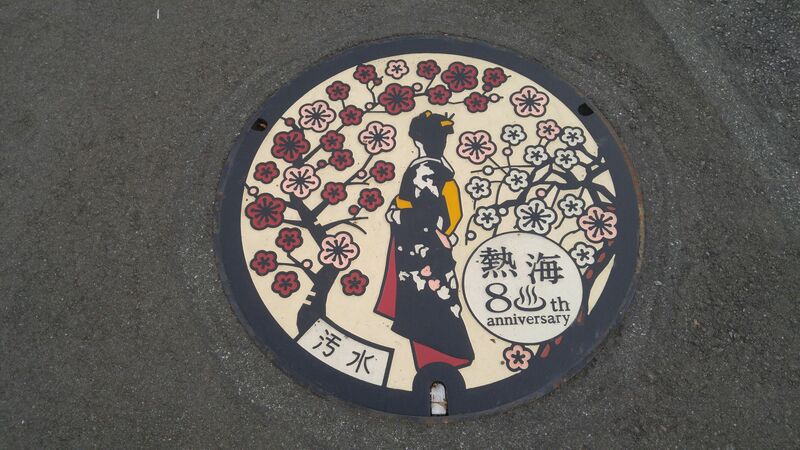 Now if you go to the beautiful Rengeiji Flower Park you will find a new cover ust before the entrance! 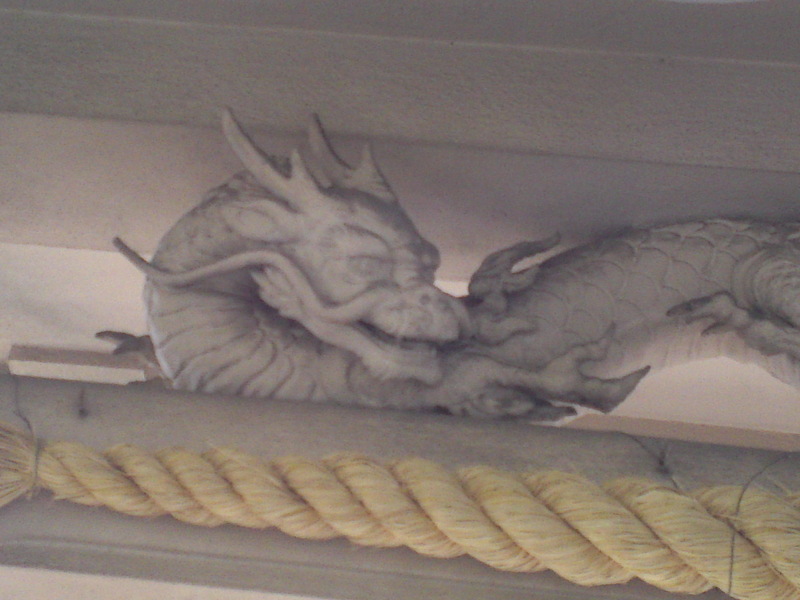 Of course you willfind the same design without he colors and in two different sizes in many locations! 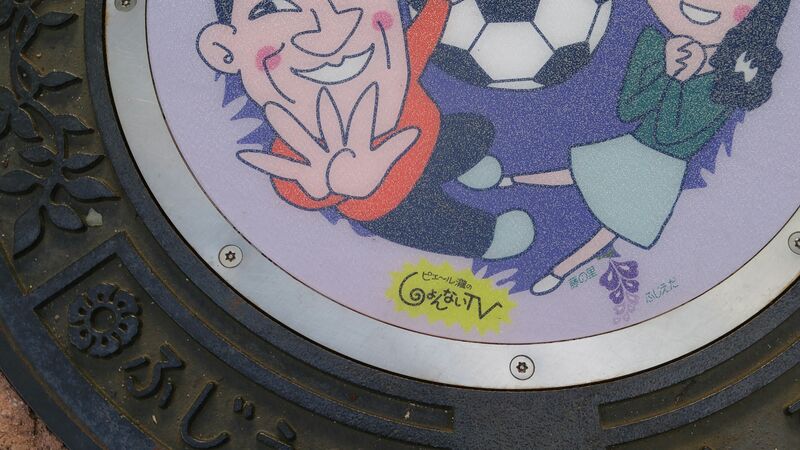 This is a far older type with the Fujieda City logo in the middle! Another old one with the same central logo! And still another one with the same logo but in rectangular shape! And to finish one with a cute mejiro among flowers! Young Nihonga Artist: Kyoko Imagawa/今川教子 (from Shimizu Ku, Shizuoka City)! General explanations of Nihonga taken from Wikipedia. 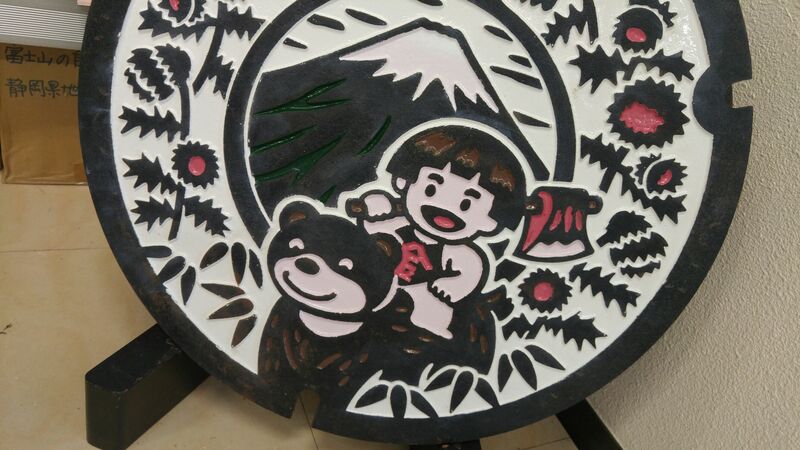 Nihonga (日本画 Nihonga) or literally “Japanese-style paintings” are paintings that have been made in accordance with traditional Japanese artistic conventions, techniques and materials. 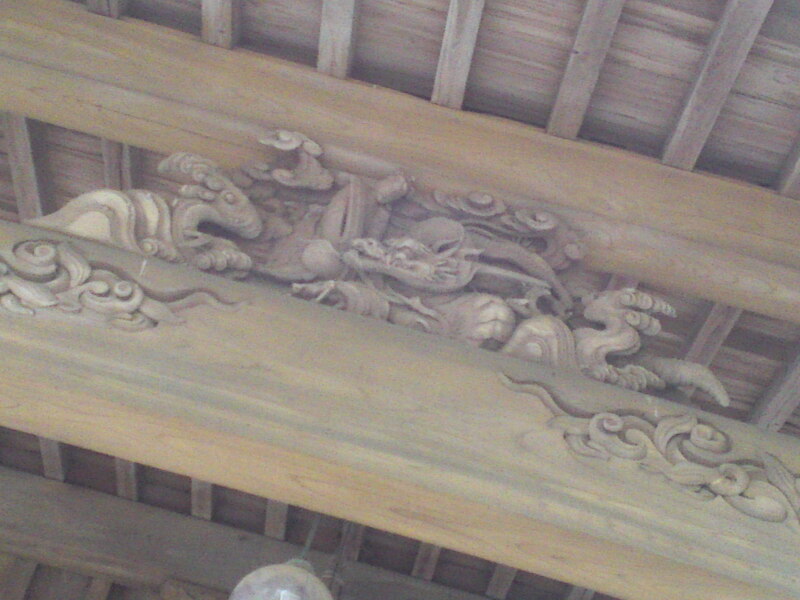 While based on traditions over a thousand years old, the term was coined in the Meiji period of the Imperial Japan, to distinguish such works from Western-style paintings, or Yōga (洋画 Yōga). 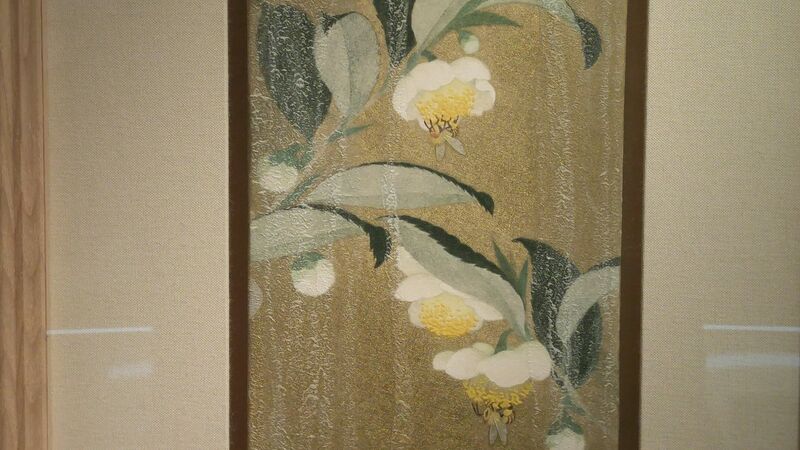 Nihonga are typically executed on washi (Japanese paper) or eginu (silk), using brushes. 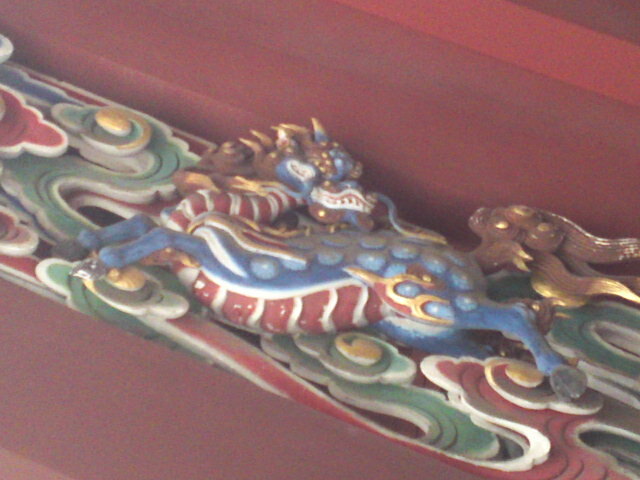 The paintings can be either monochrome or polychrome. 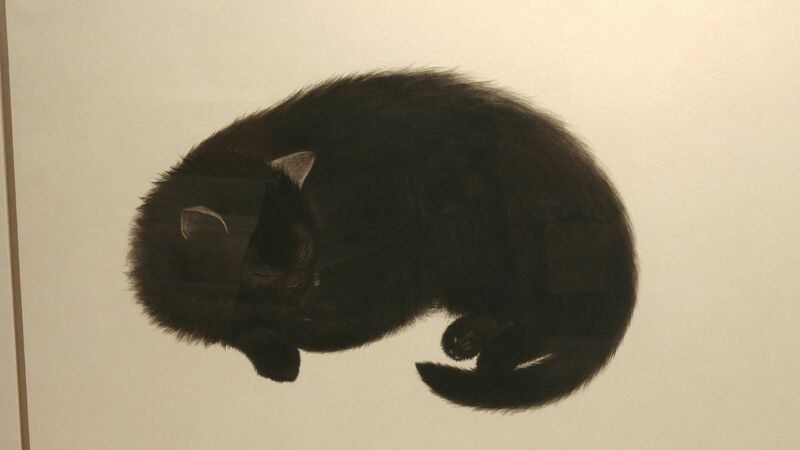 If monochrome, typically sumi (Chinese ink) made from soot mixed with a glue from fishbone or animal hide is used. If polychrome, the pigments are derived from natural ingredients: minerals, shells, corals, and even semi-precious stones like malachite, azurite and cinnabar. The raw materials are powdered into 16 gradations from fine to sandy grain textures. 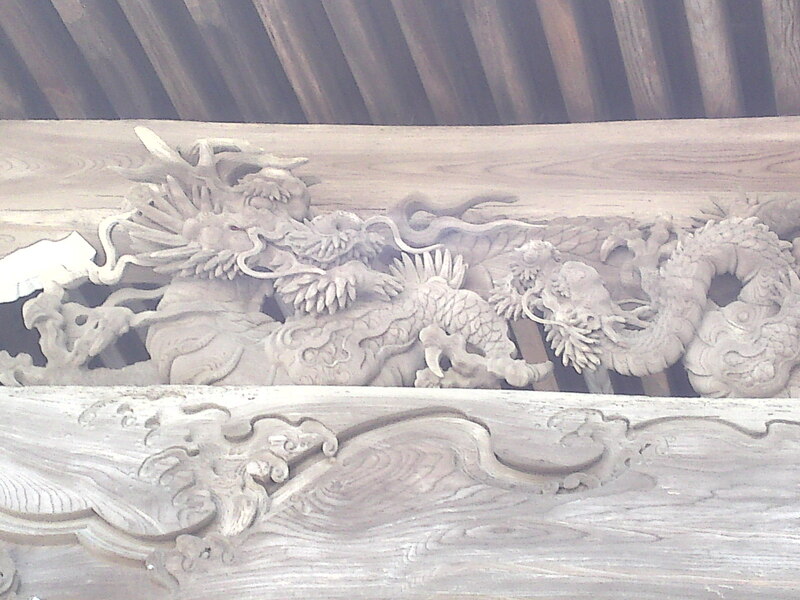 A hide glue solution, called nikawa, is used as a binder for these powdered pigments. 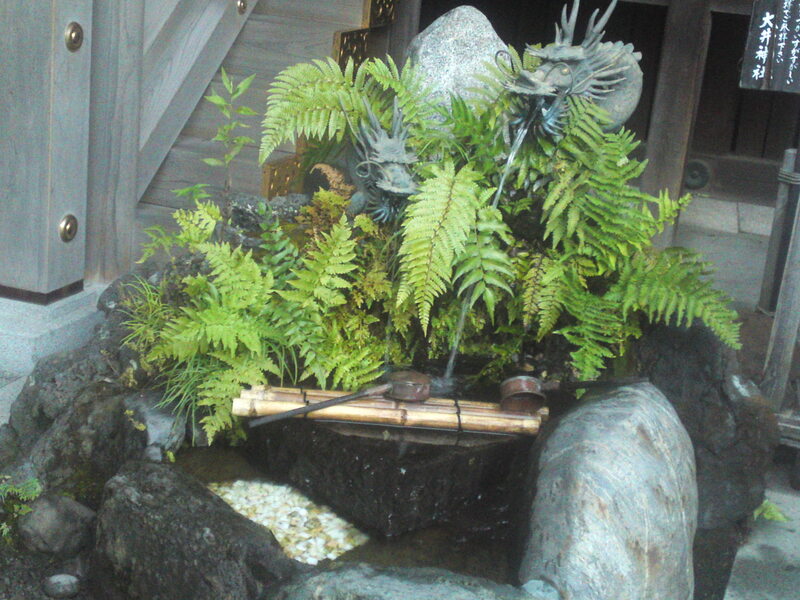 In both cases, water is used; hence nihonga is actually a water-based medium. 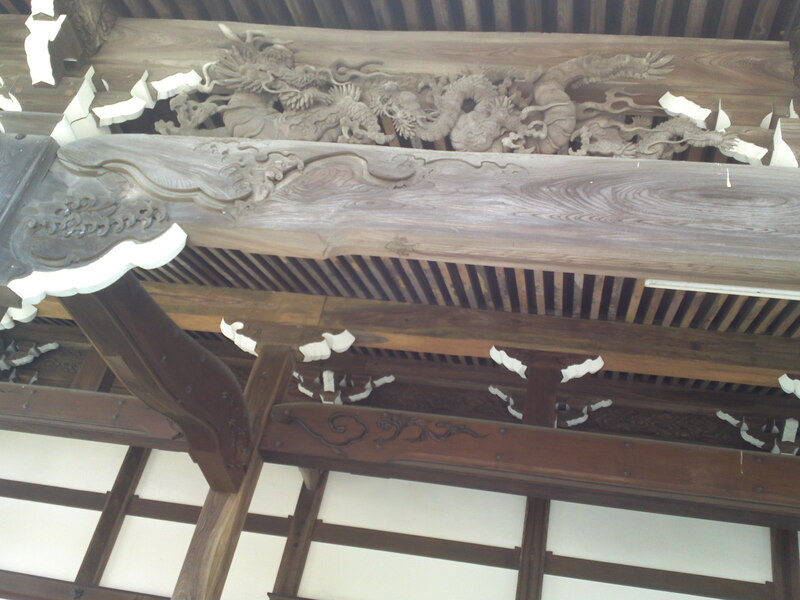 Gofun (powdered calcium carbonate that is made from cured oyster, clam or scallop shells) is an important material used in nihonga. 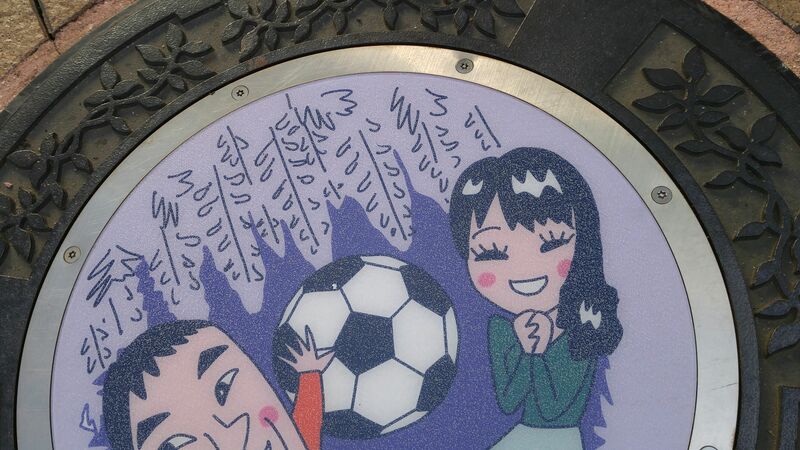 Different kinds of gofun are utilized as a ground, for under-painting, and as a fine white top color. 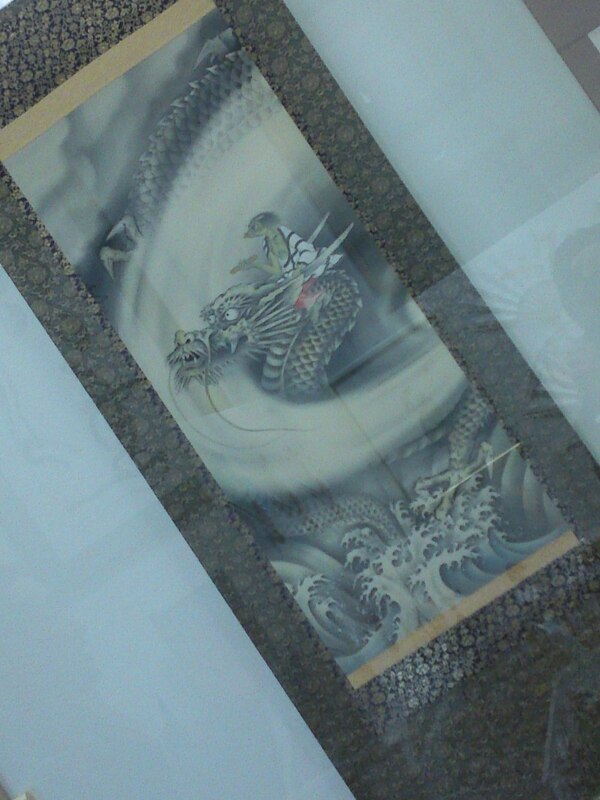 Initially, nihonga were produced for hanging scrolls (kakemono), hand scrolls (emakimono) or folding screens (byōbu). 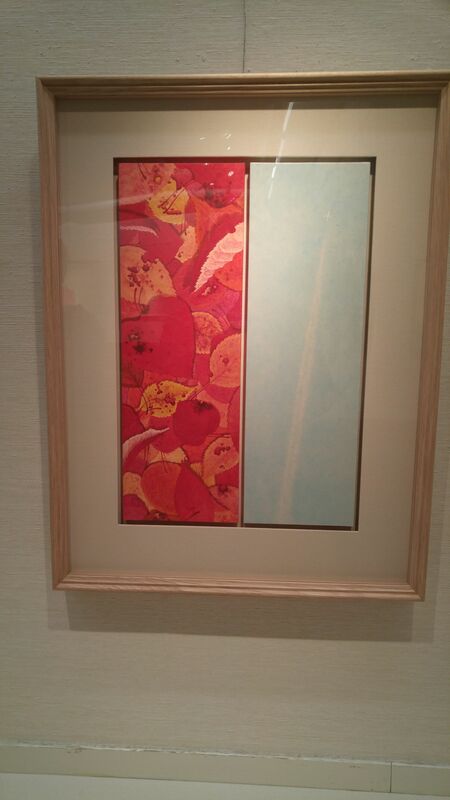 However, most are now produced on paper stretched onto wood panels, suitable for framing. 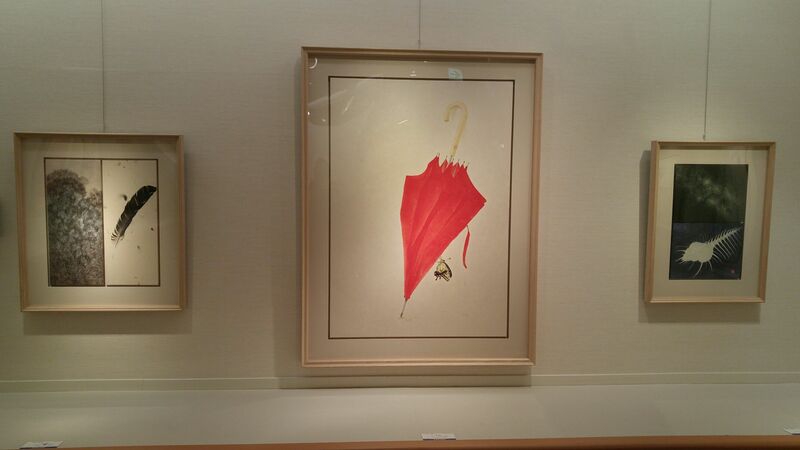 Nihonga paintings do not need to be put under glass. 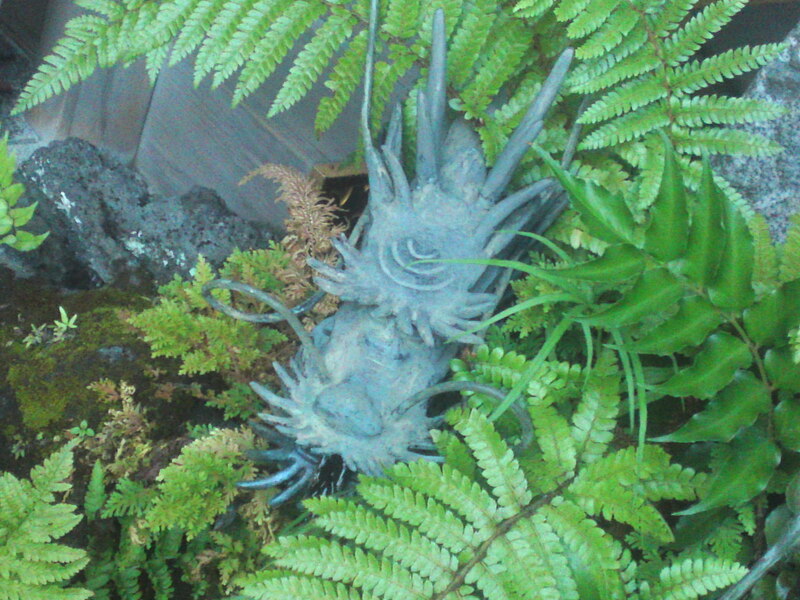 They are archival for thousands of years. 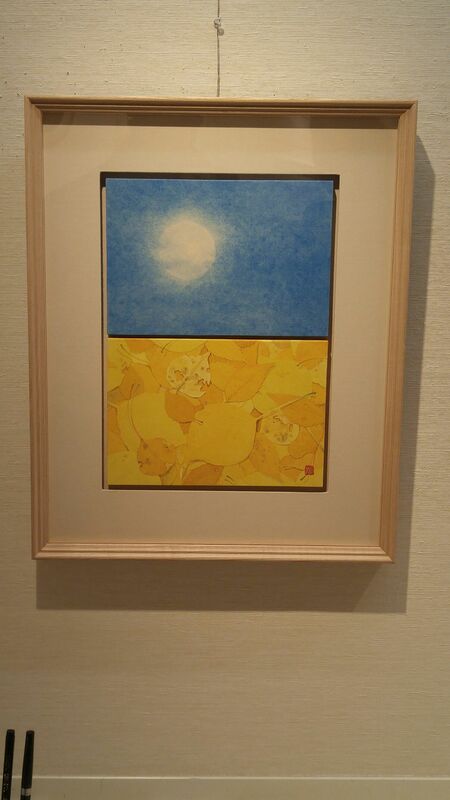 I have followed the progress of Imagawa Kyoko/今川教師子さん, a young artist born in Shimizu Ku, Shizuoka City, for some time, attracted as I was by her original approach to the art while keeping to its traditional rules and had the pleasure to meet her again in person at Matsuzakaya Department Store (Honkan/Main Building, 6 F) during her latest exhibition held February 24th~March 1st. For all her young age she is already an 11-year veteran of that demanding art (see personal history end of the article) but she is so modest and easy to approach that it becomes a real pleasure talking art with her! 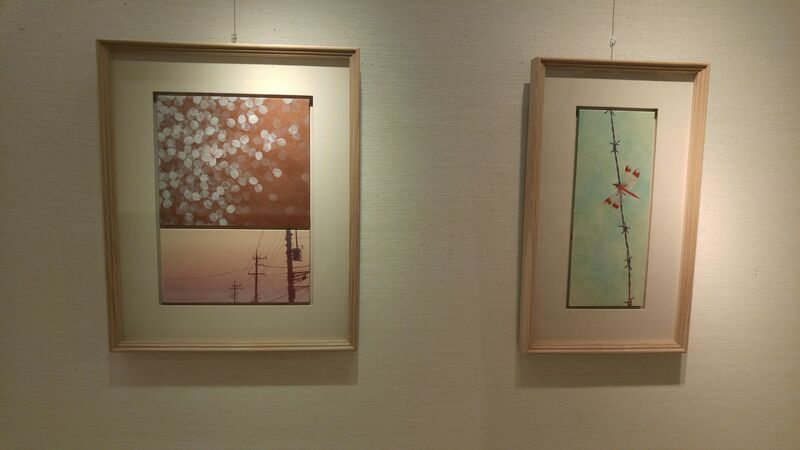 Like many modern Nihonga artists she has brought her own techniques and preferences to her art, rendering it attractive to all genders, ages and nationalities. 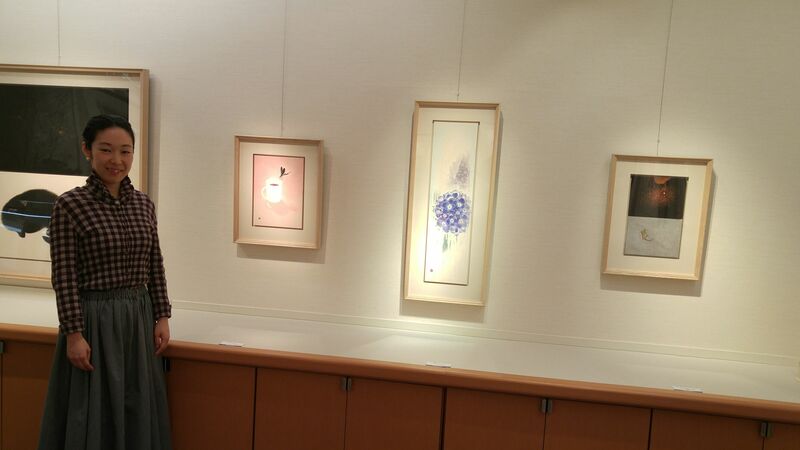 I definitely plan to interview her again soon in her atelier in Shimizu Ku, Shizuoka City, but for a start let me show some of my favorite masterpieces before they disappear from our City as the exhibition was also quite successful! I will not bother too much their individual names, but concentrate on my personal opinions and feelings! I mentioned her the English saying of insects burning themselves to death on the light of candles, and Kayoko nodded in agreement! 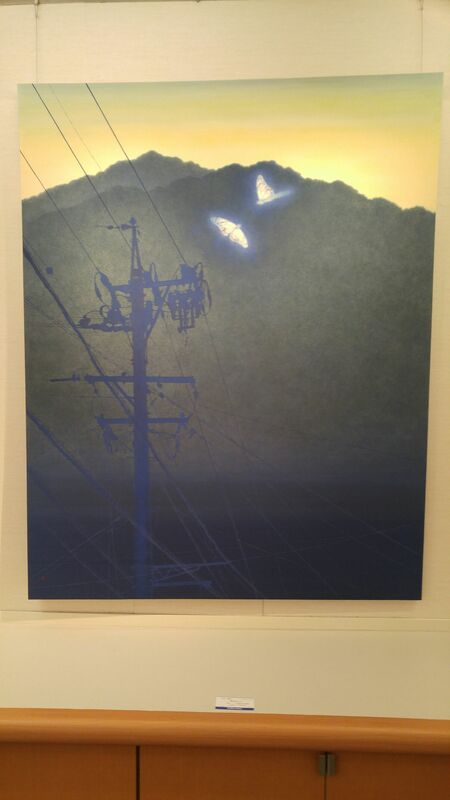 Now, who could be those butterflies dangerously fluttering near electric cables? 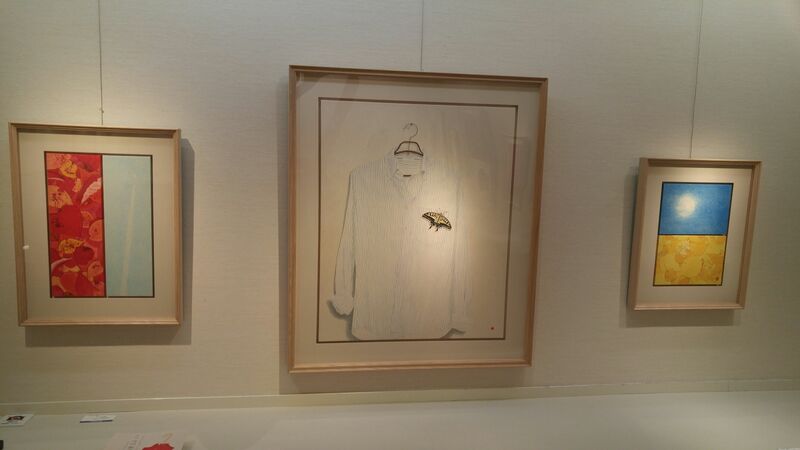 She explained that this particular exhibition’s purpose was to express her will to enjoy life through our ever-changing modern society of our age. Her paintings are songs expressing her life in different seasons and places. 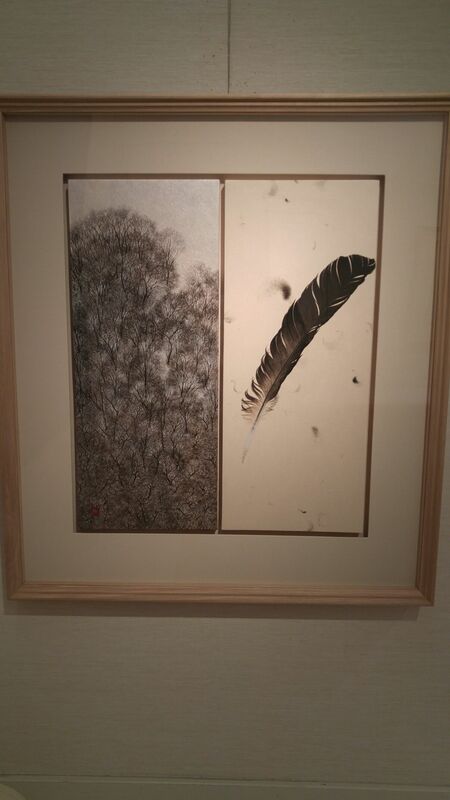 One of her typical contrasts between an intricate creation and a seemingly simple counterpart. 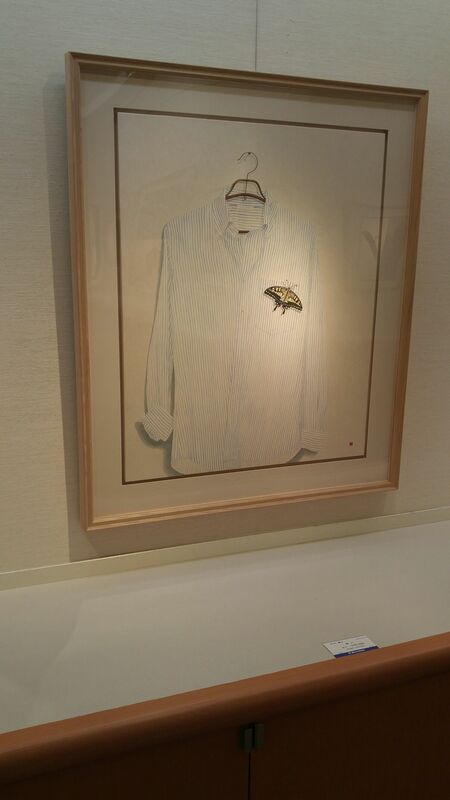 When i pointed that the shirt was man’s garment she readily agreed but surprised me by revealing that the butterfly was a brooch! 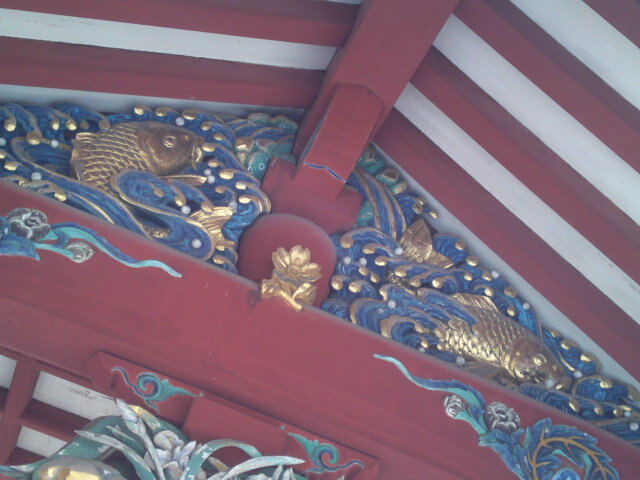 This contrast between the blue and the yellowish ocher is so Japanese! The feather discovered below the tree? 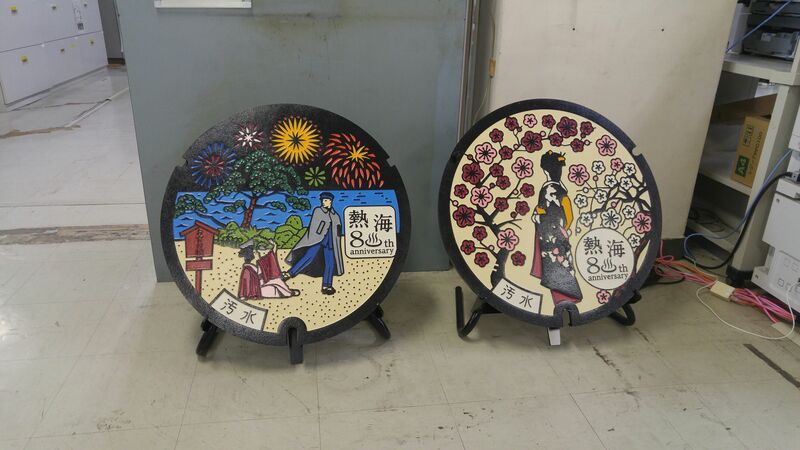 Now, tea flowers will nly be painted by the Japanese as growers leave some on the tea bushes in Shizuoka Prefecture contrary to tea plantations in the rest of the world! Now, this cat has a real story! Kayoko picked it up a few months old on a street where it had been hit by a car! A very healthy animal now! 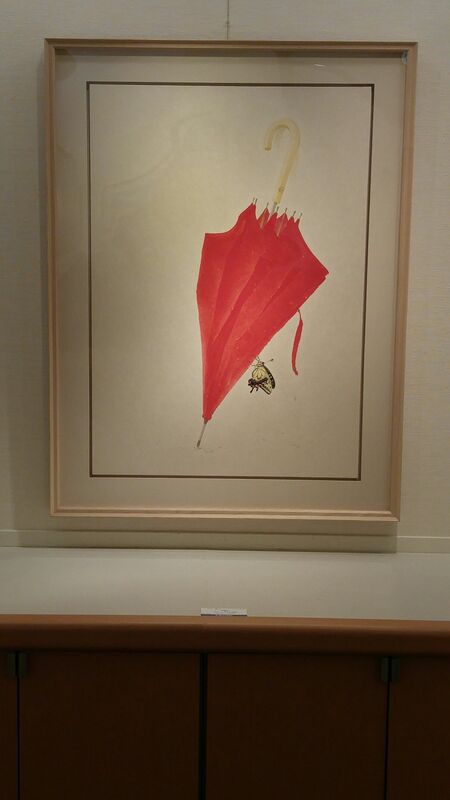 We talked a long time about this particular painting! 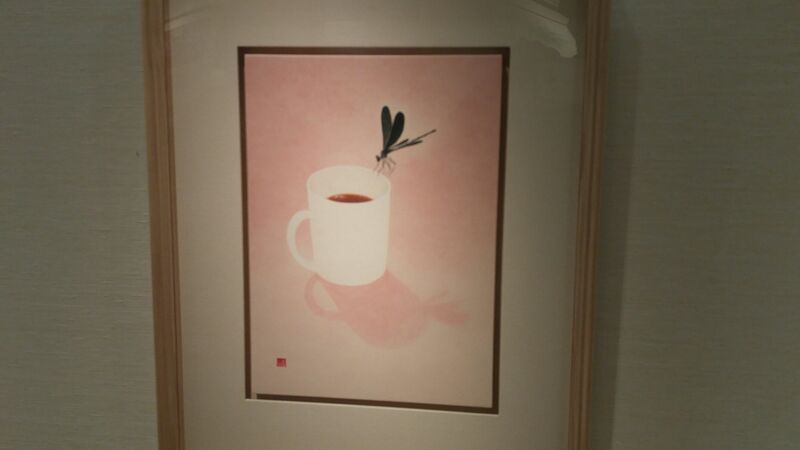 What would you say of a dragonfly perching on a cup of tea in a very feminine pink environment? Fireworks and a lizard! Definitely a summer scene! 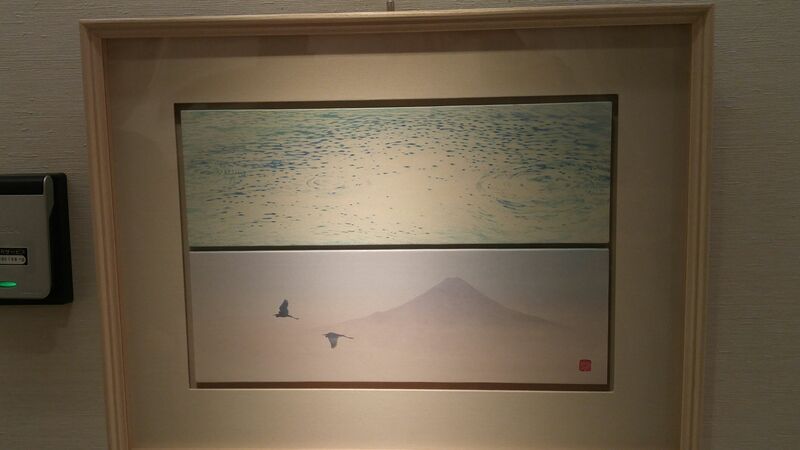 Have these cranes crossed the seas to fly in front of Mount Fuji? A favorite of mine! Clear skies after the rain? 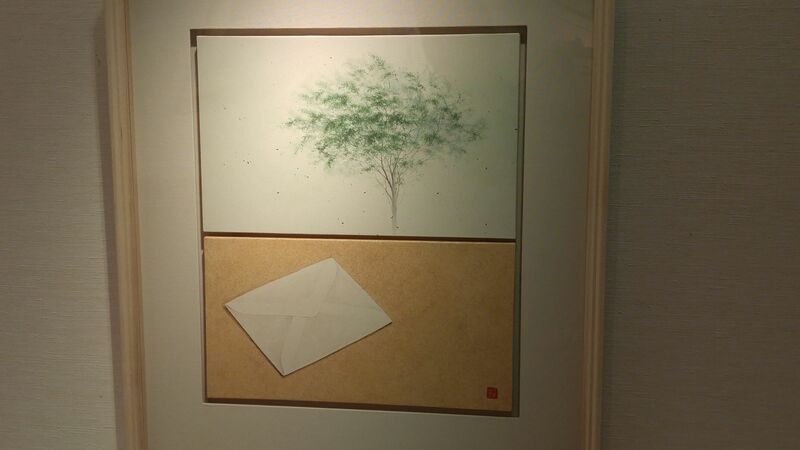 A longed-for letter in the Spring? I leave it to you for deciding the many interpretations! 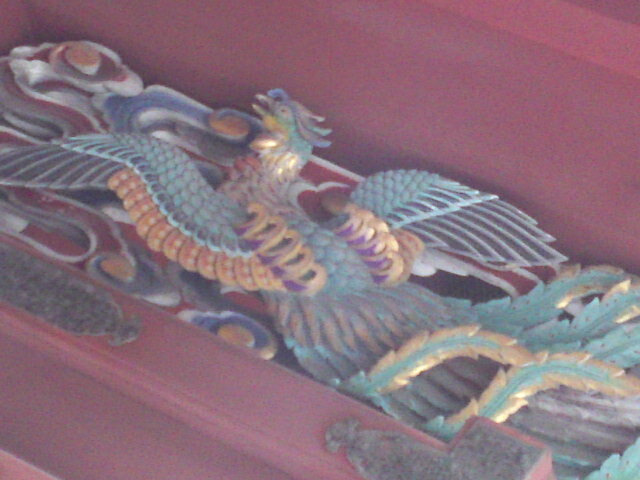 Bestiary at Sengen Shrine in Shizuoka City! 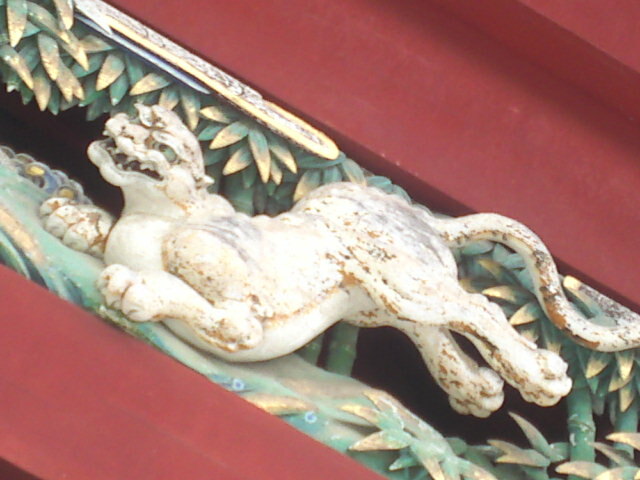 Shinto shrines in Japan, especially the big ones, are hosts to a whole menagerie or bestiary, that is “animals” which are supposed to symbolize or protect the cult abode. 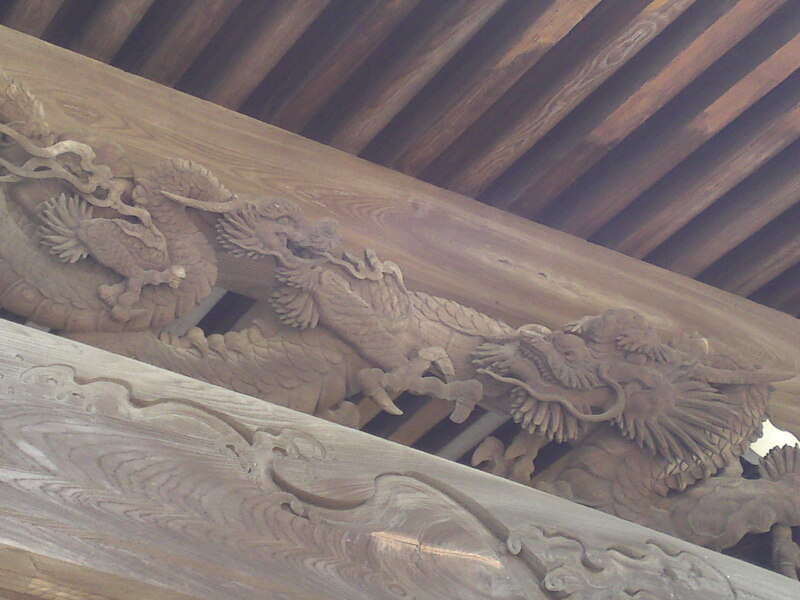 In Shizuoka City, the large Sengen Shrine is a good place to look for them! Let me show some of them. There are plenty more, but they will be for you to discover! 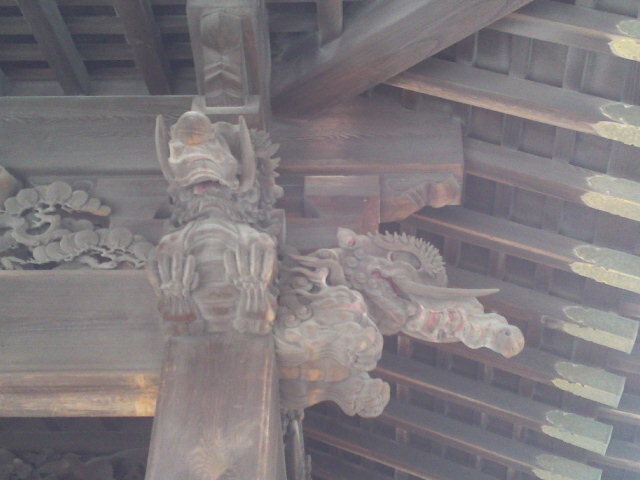 “Shishi/Lions” with an unusual “oni/goblin”! 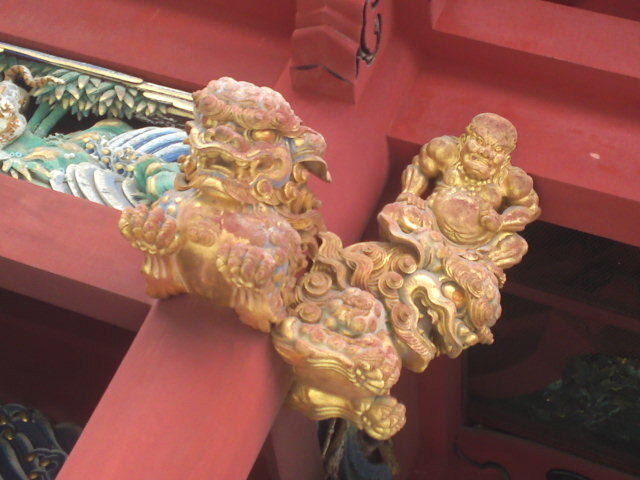 If you know where to look around you will find plenty looking after us in Shinto Shrines or looking at us in Parks or during festivals and where else! 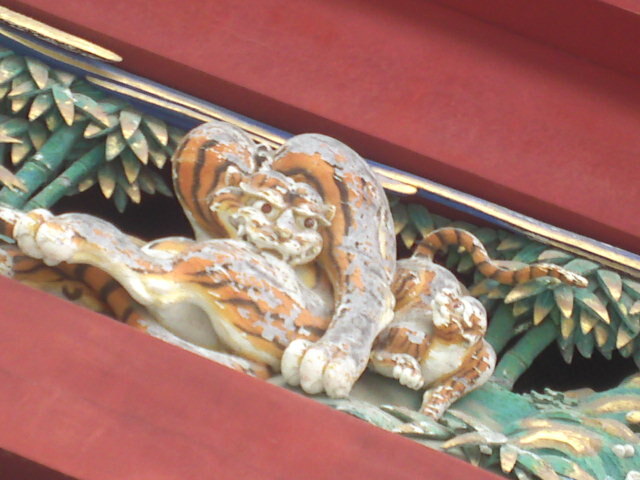 They even lurk in Buddhist temples! Shall we look for them (pun intended!)? 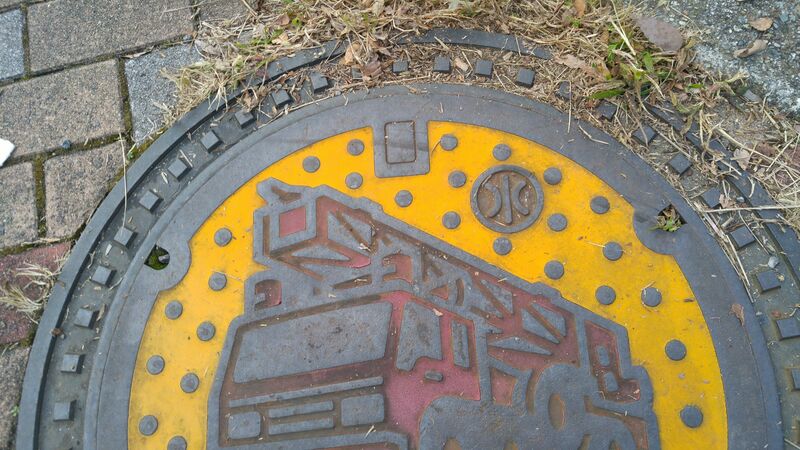 I found an old one almost invisible in Kataoka Sumiyoshi Shiren in Sumiyoshi, Yoshida Cho! I know one thing for sure: he is 100 years old or a litlle more! 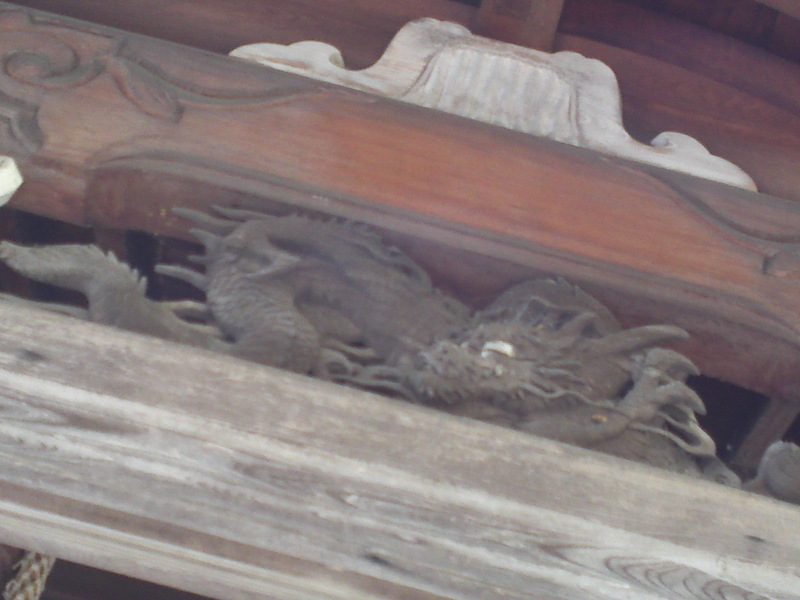 I discovered these two hiding inside Oi Shrine in Shimada City! The water is not magical and good enough to drink! 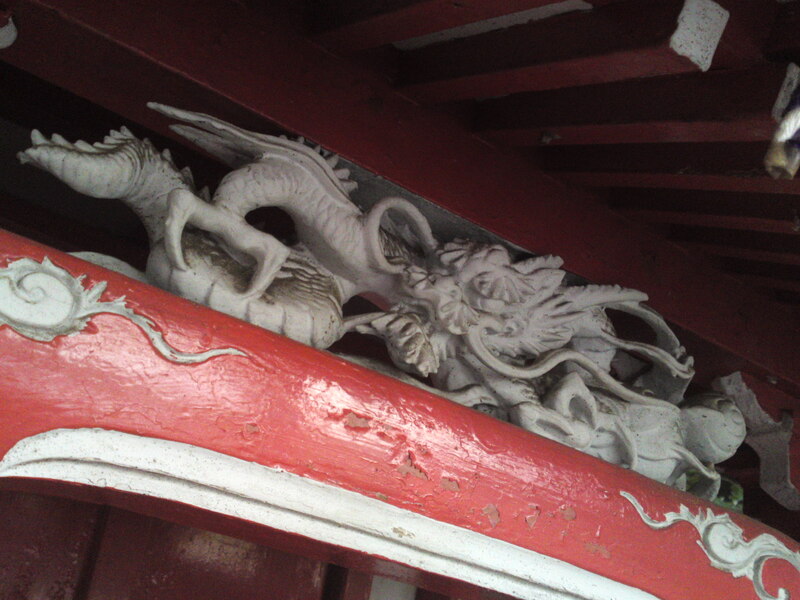 This one seems to go unnoticed in Okutsuhiko Shrine in Kuruma Cho, Aoi Ku, Shizuoka City! 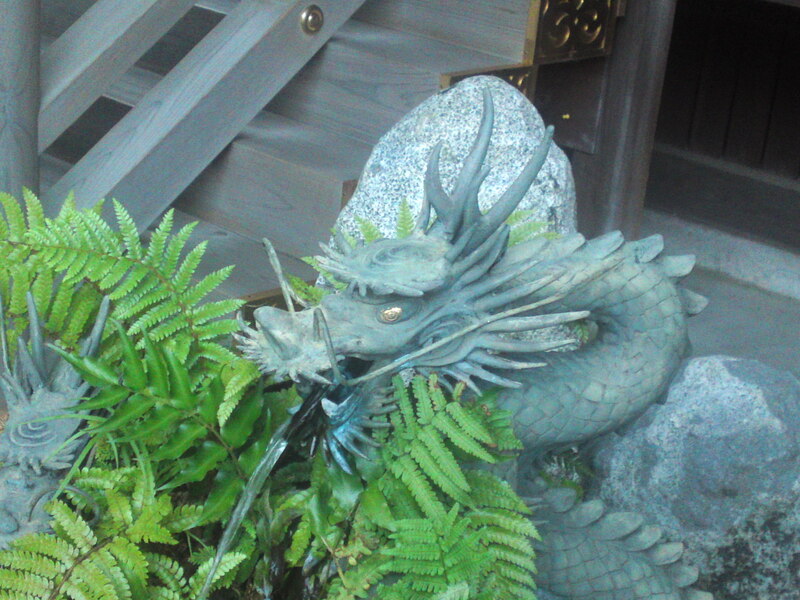 I was a bit nonplussed to find this one in a Buddhist temple called Rei Ei Ji in Aoi Ku, Shizuoka City! 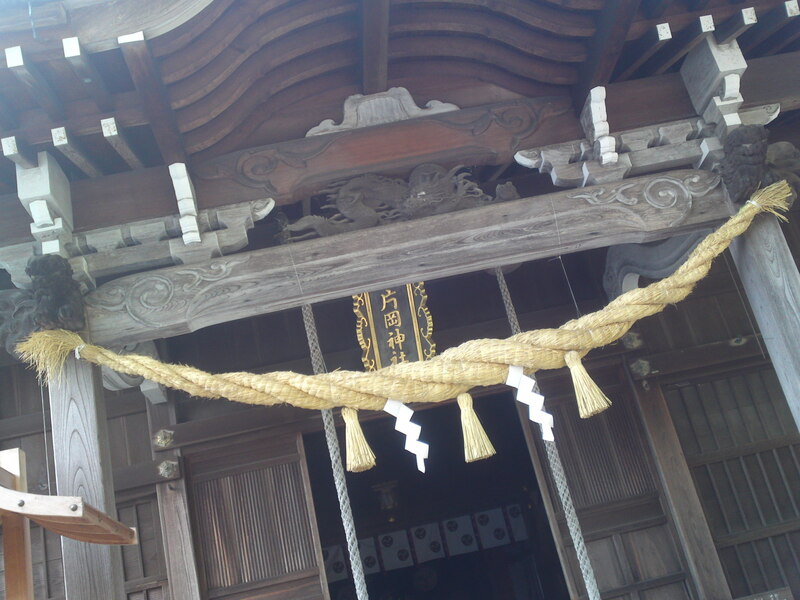 I made this discovery yesterday when I looked around in Shizunami, Mkainohara City in a Buddhist temple with an interminable name! 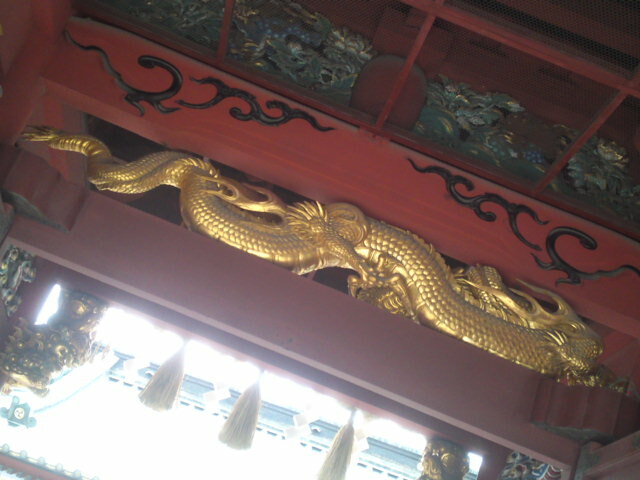 the name of the temple is Shinshuu Ootaniha Daishinkaizan Myoushouji ! It might be tempted to disappear before yu can say the name aloud! 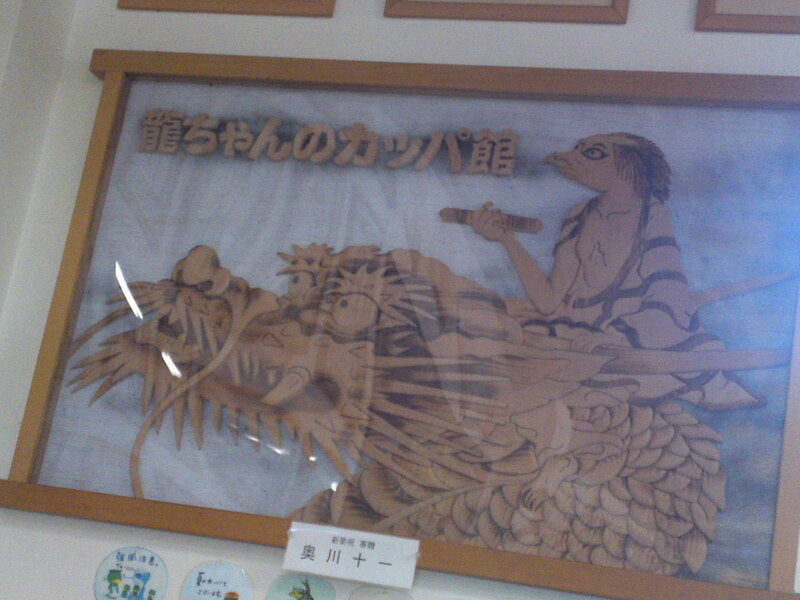 Checking my archives I unearthed this wooden one ridden by a kappa/water goblin! Practically the same on a scroll! 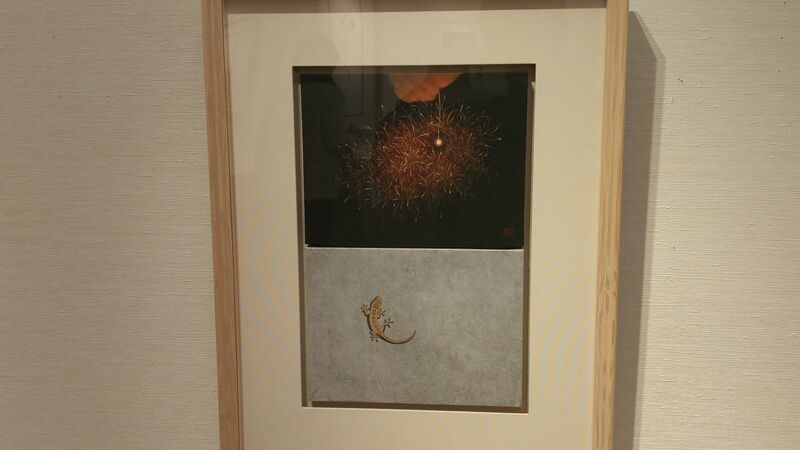 Both can be found in Hachan Kappa Museum in Yaizu City! 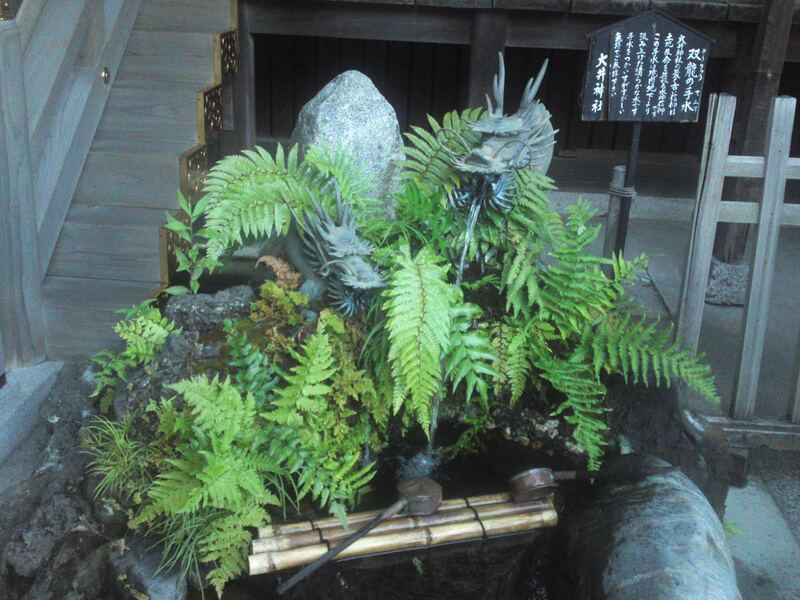 We will take our leave riding this minuscule one hidden in Ogushi Shrine in Aoi Ku, Shizuoka City!